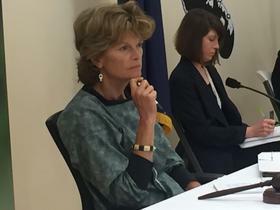 U.S. Sen. Lisa Murkowski listens to testimony Aug. 20, 2015 at a hearing of the U.S. Senate Committee on Indian Affairs hearing she chaired. Alaska has already outgrown the $250-million Goose Creek Correctional Center that opened in 2012. Instead of pouring more money into building and maintaining prisons, people testifying in a U.S. Senate Committee on Indian Affairs field hearing in Anchorage on Thursday said it’d be smarter to turn some of the money toward keeping people out of prison. U.S. Sen. Lisa Murkowski chaired the field hearing on "Strengthening Alaska Native Families: Examining Recidivism, Reentry, and Tribal Courts in Alaska,” and heard a range of solutions from the five people invited to testify. First, she shared some information from a report. “In the Lower 48 back in 2009 for the first time in 38 years it said, 26 states successfully reduced their prison populations but Alaska was not one of those,” said Murkowski. “Alaska was not one that is seeing the rates going down. In marked contrast Alaska has the 11th fastest prison population growth in the entire country. Murkowski shared another statistic she finds troubling. “Alaska Natives make up 15 percent of our state's population, 15 to 17 percent but they constitute about 36 percent of all prisoners in custody,” said Murkowski. Natasha Singh is General Counsel for the Interior Alaska regional nonprofit Tanana Chiefs Conference. She said Alaska’s law enforcement and judicial system isn’t working. “The status quo in our villages is unacceptable in any civilized country. It's unacceptable in America, and in Alaska,” said Singh. 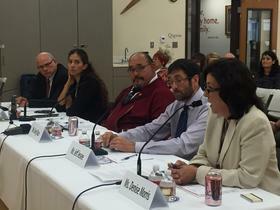 From left to right, experts testifying at the hearing include Alaska Sen. John Coghill; Natasha Singh, Tanana Chiefs Conference; Greg Razo, Alaska Criminal Justice Commission; Jeff Jessee, Alaska Mental Health Trust Authority; and Denise Morris, Alaska Native Justice Center. Singh said tribal courts are required to protect constitutional and civil rights, work well, and need to be expanded. Sen. Majority Leader John Coghill, of Fairbanks endorsed tribal courts. “In the process of time, the Native groups and the tribal groups have begun what I call a pretty decent justice system that I would say is maturing,” said Coghill. “The state has had some struggles how to work with them legally technically,” he added. Coghill has sponsored two legislative remedies. Senate Bill 117 would divert people facing misdemeanor criminal charges to tribal courts. Jeff Jessee, the head of the Alaska Mental Health Trust Authority, said 60% of the prison population has mental and behavioral health issues. As for people relapsing into crime after they leave prison, Jessee said the solutions involve more than the departments of public safety and law. The head of the Alaska Native Justice Center, Denise Morris, said the public also has a part to play. “Another key component that we do at the Alaska Native Justice Center in partnership with a lot of people, we don't do this alone, is educating the public of the value of giving people a second chance,” said Morris. Murkowski told the audience of about 30 people the public record for the hearing will remain open for a few weeks if anyone wishes to submit written testimony.